New York, December 12 — Excitement is building for GALA ITALIA, which will officially kick off on February 19th at The Pierre Hotel in New York to celebrate its 30th anniversary and, at the same time, the great success of Italian wine in the United States. This success will be the driving force behind the celebration. A thirty-year initiative unrivaled in the world, GALA ITALIA 30 will highlight the strong achievements by Italian wine, whose exports to the U.S. grew from $44 million in 1975 to over $1.4 billion in 2015. This undisputed success, which has placed Italy at the forefront of countries exporting to the U.S. in both value and quantity, as well as in variety and excellence of the range of wines offered, will attract considerable media attention at the event. Among the many elements that will shed light on this success will be the display of 1985 vintage bottles, whose thirty years of life will underline the thirty years of the GALA ITALIA and the thirty years of continuous accomplishments of Italian wine. At this unique celebration, its protagonists – some of the most renowned Italian wine producers – will personally come to New York for this unmissable event. It will be an occasion to present to the most qualified American wine editors some of the best wines of their production, including a special vintage wine uniquely selected for GALA ITALIA 30. Meanwhile, their bottles – the stars of this celebration – are now on their way from Italy. The 1985 vintage bottles will be exhibited at the center of the Grand Ballroom, where they will be photographed and filmed by hundreds of journalists, photographers and cameramen. Treated with great care as befits the stars of the event, the wine bottles will be auctioned off during the Gala Dinner that will follow GALA ITALIA 30. Among the stars: a rare Giulio Ferrari Riserva del Fondatore 1985 from the private reserve of the Ferrari family; a Tignanello 1985 of Marchesi Antinori; a Brunello di Montalcino DOCG Riserva 1985 of Biondi Santi; a Rosso del Conte 1985 of Conti Tasca d’Almerita; a Rubesco Vigna Monticchio Torgiano DOCG Riserva 1985 of Lungarotti; a La Corte IGT Toscana 1985 of Castello di Querceto; a Spargolo IGT Toscana 1985 of Casa Cecchi; a Brunello di Montalcino DOCG Riserva 1985 of Col d’Orcia; a Chianti Classico DOCG Riserva 1985 of Tenuta Castello d’Albola of Zonin; a Barolo DOCG Riserva 1985 of Fontanafredda; a Cannonau di Sardegna DOC 1985 of Sella e Mosca; a Chianti Classico DOCG Riserva 1985 of Rocca delle Macie; an Arele 1985 of Cavit; a Barolo DOCG Riserva 1985 of Pio Boffa and an Amarone DOCG 1985 of Bertani, to name a few. The main feature of GALA ITALIA 30 is its grand Wine & Food Tasting, which will be held from 12:00 p.m. to 6 p.m. in the prestigious Grand Ballroom of The Pierre Hotel, specially prepared and decorated for this event. Over 1,000 qualified and selected trade representatives, restaurateurs and journalists from across the U.S. Atlantic Coast are expected at what is the most important event dedicated to Italian wine in the United States. All of the guests will be pre-registered on-line. Electronic registration will open on Monday, December 15. The event will emphasize the importance of traditional food and wine pairings, thanks to the presence of some of the most prestigious manufacturers of Italian food and some of the most famous Italian restaurants in New York City, including Cacio e Vino, Le Cirque, Macelleria, Osteria del Circo, Piada, Risotteria Melotti and Serafina. To complete GALA ITALIA 30 and make it even more interesting in the framework of the prestigious “Made in Italy,” there will be an informal fashion presentation by a famous Italian house, whose name will be the subject of a separate announcement. To further promote and highlight the presentation of these wines, an American jury will select the best wine of each participant and present the wine with a special “Certificate of Merit.” To all the wine producers will be consigned a gold medal attesting their participation in the thirtieth anniversary of GALA ITALIA. A colorful GALA ITALIA 30 catalog will enhance the importance of all of the companies and sponsors involved in the event, with ample information provided for each participant. The catalog will also provide wide coverage and a series of charts highlighting the success achieved by Italian wines in the past thirty years. The catalog will be distributed to all present and subsequently sent to the major leaders in the wine and food industry. In addition, all material published in the catalog will be displayed on the web-site of the Italian Wine & Food Institute. GALA ITALIA 30 will be followed by a special black-tie Gala Dinner in the Grand Ballroom of The Pierre Hotel. Dinner will be prepared by the chef of Le Cirque restaurant, and will be paired with the finest, special vintage wines provided by some of the most important Italian wine producers in attendance. During the Gala Dinner, a charity auction of the thirty year-old wines will take place, followed by the presentation of the “Special Awards of Merit” to leading personalities in honor of the wine and food that represent Italian excellence in the world. The Gala Dinner, which will have in attendance some of the most important American personalities, distinguished guests and prominent TV and print journalists, will conclude late in the evening with the music of Panorama Orchestra. GALA ITALIA 30 is organized by the Italian Wine & Food Institute under the high patronage of the Ambassador of Italy to Washington, D.C. and the sponsorship of the Italian Trade Commission and Veronafiere – Vinitaly. New York, October 23 — The great success obtained by Italian wines in the U.S. import market and the producers (the protagonists) behind this success will be the subjects of major celebration at the 30th anniversary of GALA ITALIA. This elegant affair will take place on February 19, 2015 in the elegant ballroom of The Pierre Hotel in Manhattan. GALA ITALIA 30 will serve as a celebration of the finest wines from Italy and will underline the extraordinary dimensions of this incredible success, which is unprecedented in the history of wine, to the many wine and food journalists, opinion leaders, VIPs, trade representatives and lovers of Italian wine in attendance. In addition to celebrating its 30 years of life, as pointed out by the Italian Wine & Food Institute President Lucio Caputo, GALA ITALIA 30 will strongly emphasize the enormous achievements made for Italian wine that have put it at the top of the U.S. market. This consistently rising and undisputed success has placed Italy at the forefront of countries exporting to the United States in both value and quantity, as well as in variety and excellence of the range of wines offered. GALA ITALIA 30 will shed light on this important achievement by having vast coverage from the most established American journalists. Furthermore, many distinguished VIPs and and the most qualified, prestigious Italian producers, whose contributions helped lead to the success of Italian wine, will come to New York to personally celebrate this exciting event. As one of the many unique initiatives to be held in connection with GALA ITALIA 30, a memorable presentation of thirty bottles with 1985 vintage (reflecting the first edition of GALA) will stand under the spotlight of the American media. But that is not all. A large number of other important initiatives will complement this twelve-hour celebration, beginning with an impressive Wine & Food Tasting, followed by a black-tie dinner, an awards ceremony, an auction of thirty-year old wines, and ending late at night with the tunes of Panorama Music. Lucio Caputo, who for forty years (1975 – 2015) has promoted Italian wine in the U.S.—first as Italian Trade Commissioner and then as President of the Italian Wine & Food Institute—has expressed great satisfaction with Italian wine’s achievements (from 240 million to over 1.3 billion dollars of Italian wines exported) and hopes that its success will continue in the future. ITS POSITION IN THE U.S.
New York, October 9 — Italian wine continues to maintain its leadership position in the American market with a slight decrease of 0.9% in quantity and an increase of 5.5% in value, according to a note issued today by the Italian Wine & Food Institute. These figures are relative to the first eight months of 2014 in comparison with the corresponding period in 2013. 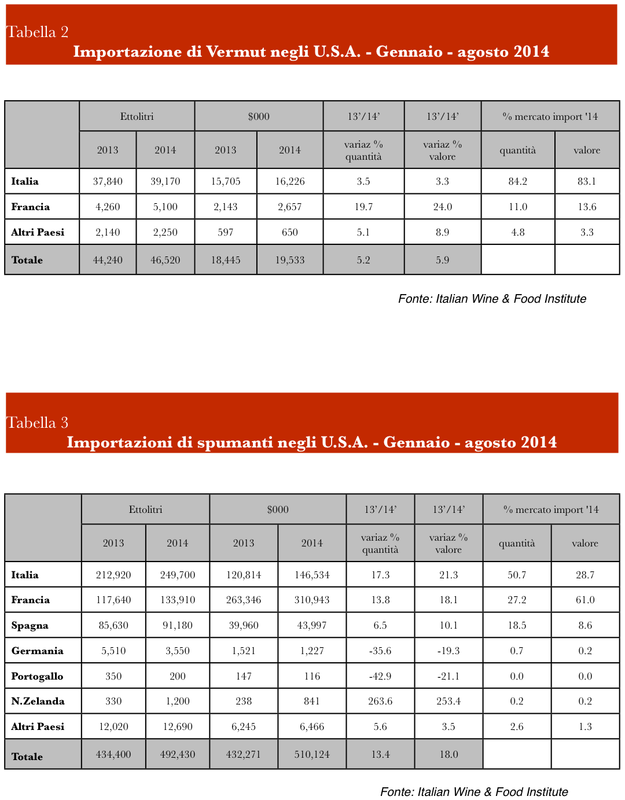 The situation of Italian wine is judged positively by the President of the Institute, Lucio Caputo, especially in comparison with the decrease of total imports to the U.S. (-4.5%) and the considerable reduction of imports recorded by the main countries competing with Italy. Falling to third place among the exporting countries, Australia, which had in the past tried to undermine Italy’s leadership, shows a reduction of -12.4% in quantity and -10.8% in value. Argentina follows behind, with -0.4% and -3.9%, respectively, and then South Africa with -62.1% and -30.5%. Similarly, imports are decreased in quantity from France (-3.3%), Spain (-14.1%) and Germany (-11.9%), which rank in fifth, sixth and eight place, respectively, among the exporting countries to the U.S. market. The only three countries that have improved their positions among the ten principal suppliers to the U.S. market, which together hold 98.6% of the import market, are: Chile, which rose to second place with an increase of 1% in quantity and with a significant reduction in value (-12.2%), thus confirming that the reduction in the prices of Chilean wines has favored their expansion; New Zealand (+18.4% and +15.6%) and Portugal (+16.3% and 19.7%), ranking seventh and ninth place, respectively, among the exporting countries to the U.S. market. 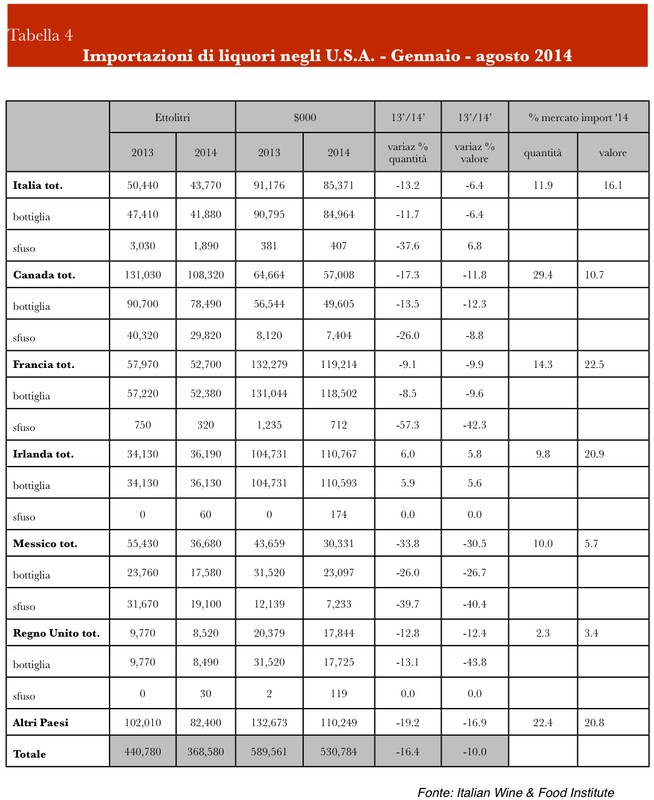 According to this same note of the Italian Wine & Food Institute, Italy exported 1,683,770 hectoliters for a value of $917,724,000 in the corresponding eight months of this year, compared with 1,698,320 hectoliters for a value of $869,654,000 in the first eight months of 2013. The market share of imported wines from Italy rose to 28.2% in quantity and 34.4% in value, compared to Chile’s 17.8% in quantity and 7% in value. Chile currently stands as the second largest exporter to the U.S. According to data released by the Italian Wine & Food Institute, total U.S. imports during this reported period amounted to 5,968,770 hectoliters for a value of $2,668,899,000, in contrast to the 6,252,540 hectoliters for a value of $2,596,469,000 of the corresponding period of the previous year. The position of Italian sparkling continues to expand in the market, according to figures released by the Institute. Italian sparkling wines showed a significant increase of 17.3% in quantity and 21.3% in value, rising from 212,920 hectoliters for a value of $120,814,000 in the first eight months of 2013 to 249,700 hectoliters for a value of $146,534,000 in the first eight months of 2014. 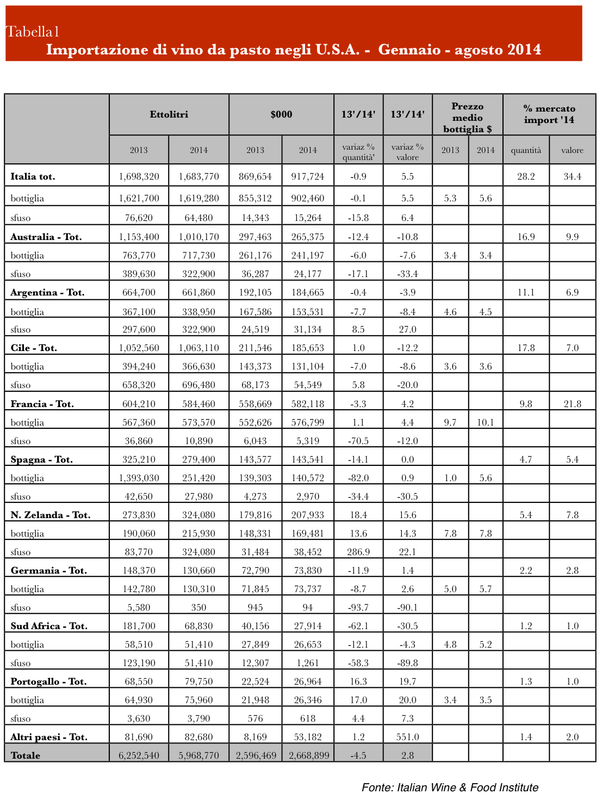 Italy holds 50.7% in quantity and 28.7% in value of the market share of imported sparkling wines. The positive trend of Italian wine is a welcoming point, according to Lucio Caputo, for the forthcoming Gala Italia 30, which will be on February 19, 2015 at The Pierre Hotel in Manhattan. New York, September 18 — The great success of Italian wine in the United States will be the primary theme of the GALA ITALIA that will celebrate its 30th anniversary on February 19th in The Pierre Hotel’s Grand Ballroom. In addition to its very important and prestigious 30th year of life, the GALA ITALIA 30 will strongly underline the success of Italian wine in the United States, as emphasized by Italian Wine & Food President Dr. Lucio Caputo. In fact, Italy is at the forefront in the ranking of countries in the U.S. import market both in value and in quantity, and in its impressive variety of high-quality wines. To recognize and attract major media coverage of Italian wine’s success, GALA ITALIA 30 will have the personal presence of the most qualified, prestigious producers from Italy, each of whom will contribute wines vintaged in 1985 (thirty years ago) for the thirty years of GALA ITALIA. An exciting cycle of events will start with the wine and food tasting, followed by a black-tie dinner and awards ceremony, then an auction of wines vintaged 30 years, and lastly, live music and dancing. Dr. Caputo has been promoting Italian wine in the U.S. for almost forty years (1975 – 2015), first as Italian Trade Commissioner and then as President of the Italian Wine & Food Institute. He has expressed great satisfaction with the achievements for Italian wine (from $240 million to over $1.3 billion worth of wine exported) in the U.S. market, and hopes that its success will continue, despite the increasingly fierce competition. New York, August 14…..A series of six wine seminars and six wine tastings will be organized by the Italian Wine & Food Institute with one of the most prestigious cruise lines in the world, MSC Cruises, in the dazzling Divina as the ship sails across the Caribbean. The first set of this exciting series will take place from August 16 to 30, 2014. Over 50 people will participate in these enlightening seminars, led by the president of the IWFI and highly-renowned wine expert, Dr. Lucio Caputo. President Caputo will illustrate all aspects of wine from winemaking to wine-drinking, including the art of tasting wine, the pairing of food and wine, and the proper storage techniques. Slideshows with creative graphics, printed reading material, and quizzes will provide participants with a deeper understanding of Italian wine, as well as encourage active involvement from each participant. After each sit-down seminar, participants will taste a variety of well-known and distinguished Italian wines, including sparkling, white, red, and dessert wines. In a comfortable and relaxed setting, participants will learn how to properly taste each wine and then offer their opinions in an open and enlightening discussion. The first sit-down tasting will cover aspects of Italian white wines. During the tasting, participants will learn specifically about the following: Feudo di San Gregorio, Greco di Tufo DOCG, 2012; Cantine Farro, Campi Flegrei Falanghina DOC, 2012; Fazi Battaglia, Verdicchio Classico Superiore DOC, 2012; Girlan, Indra Sauvignon Blanc, Alto Adige DOC, 2012; Santa Margherita, Pinot Grigio Valdadige DOC, 2012; Rocca, Salento Chardonnay IGT, 2011; and Langhe Arneis DOC, 2011. Red wines will be the highlight of the second tasting, particularly: Borgogno, Barbera d’Alba DOC, 2011; Le Vigne di Zamo’, Colli Orientali del Friuli Merlot DOC, 2011; Il Poggione, Rosso di Montalcino DOC, 2011; Calatresi e Micchiche’, Nero d’Avola Sicilia IGT, 2012; Cavazza, Cicogna, Cabernet Colli Berici DOC, 2012; Marchesi Antinori Peppoli, Chianti Classico DOCG, 2011; Mastroberardino, Radici Taurasi DOCG, 2008; and Col d’Orcia, Brunello di Montalcino DOCG, 2008. The final sit-down tasting will feature a discussion and tasting of sparkling wines. Participants will taste: Banfi, Bracchetto d’Aqui DOCG Rosa Regale, 2012; Martini & Rossi, Prosecco DOC, N/V; Fontanafredda, Asti, DOCG, N/V; and Valdo, Brut Rose’, N/V. Participants in the course will also have the opportunity to taste the wines offered by the cruise ship at dinner so that they may apply the knowledge that they learned from both the seminars and wine tastings. Further adding to this special experience, each participant will receive a personalized diploma from the Italian Wine & Food Institute in a ceremony at the end of the course and have their photo taken with the ship’s captain. Passengers aboard MSC Divina will be able to register a half hour before the beginning of the first seminar. Inspired by the famous Italian actress Sophia Loren, MSC Divina is a luxurious vessel that will sail through the turquoise waters of the Caribbean. The ship includes an impressive, elegant entrance with two dramatic Swarovski crystal staircases and a classical quartet to welcome each passenger on board. In addition to these exciting new wine seminars, MSC Divina offers sweeping panoramic views, shops, an exclusive yacht club restaurants, spas and more. New York – July 31…Exceptional quality Italian wine will once again be brought to the forefront of the grand stage of New York on the occasion of the GALA ITALIA 30. This wine and food extravaganza will take place on Thursday, February 19th in the Grand Ballroom of The Pierre Hotel. Next year will see a special edition of what is unanimously considered the most important Italian promotional event: the celebration of reaching its 30 year milestone. An initiative of commitment, tradition and media attention, the GALA ITALIA 30 has been held every year in the United States since December 2, 1985. This annual event, dedicated to promoting the best of Italian excellence in wine, food and gastronomy, consistently involves the participation of the leading and most prestigious Italian wineries, the most noted producers of specialty foods and beverages, and the most established Italian restaurants based in New York. These participants select for the occasion their finest products to promote wine and food in a unique setting of the highest level. The most important element of the GALA ITALIA 30 will be its grand Wine & Food Tasting, which will be held in the elegant and prestigious Grand Ballroom of The Pierre Hotel, specially prepared and decorated for the event. The Wine & Food Tasting will have the attendance of more than 1,000 qualified and selected wine and food trade representatives, restaurateurs and journalists from across the Atlantic Coast of the U.S., who for years have participated in what is the most significant event for Italian wine in the U.S. All of the guests will have pre-registered on-line. Adding balance to the exhibited wine, a wide assortment of Italian food will be available, thanks to the participation of prestigious food manufacturers and famous restaurants. Wine and food pairings will be given strong emphasis during this traditional Italian event that celebrates its 30th year of life. There will also be a number of publicized initiatives (to be announced in the coming months) that will serve to celebrate the 30th birthday of GALA ITALIA, the longest-held Italian promotional event in the world. One of these initiatives will pay a special tribute to the 37 companies that participated in the first edition of GALA ITALIA 30: Antinori, Barbi Colombini, Bersano, Biondi Santi-Greppo, Bolla, Càvit, Collavini, Col d’Orcia, Contratto, Duca d’Asti, Duca di Salaparuta, Fabiano, Fazi Battaglia, Ferrari, Fiore, Fontanafredda, Frescobaldi, Gajerhof, Gotto d’oro, Guicciardini Strozzi-La Cusona, Kettmeir, Livio Felluga, Marchesi di Barolo, Martini & Rossi, Pighin, Pio Cesare, Poggio alla Sala, Regaleali, Ricasoli, Riunite, Rocca delle Macie, Ruffino, S. Margherita, Torresella, Villa Banfi, Villa Cerna and Zonin. 30 years after the historic first edition, some of the most prestigious names in Italian wine will again present the best wines in their production to the most qualified professionals and American wine editors. Among their exhibited wines will be a particularly special vintage wine specially selected by each producer for GALA ITALIA 30. To encourage the submission of high-quality wines, an American jury will select the finest wine of each participant by bestowing a special “Certificate of Merit,” which will also celebrate the Gala’s 30th year. For GALA ITALIA 30, there will also be an elegant, colorful catalogue with ample space dedicated to the participating companies and sponsors of the event. The catalogue will be distributed to all present and subsequently sent to the major industry leaders. The catalogue will be completed with information on the wines, all of which will be incorporated in the Institute’s web-site. The event will be complemented by a special black-tie Gala Dinner in the Grand Ballroom of The Pierre Hotel. The dinner will be prepared by Italian chefs and will be paired with Italian wines of special vintages. During this evening gala, the “Special Awards of Merit” will be presented for particular wine and food that represent Italian excellent in the world. The awards will be accepted by the producers, all of whom will be personally present at the Gala Dinner. Also present at the Gala Dinner will be the most important American personalities, many distinguished guests and the most prominent representatives of the media. GALA ITALIA 30 is organized by the Italian Wine & Food Institute under the high patronage of the Italian Ambassador to Washington, D.C.
New York – February 25….With a welcome message from the new mayor of New York, Bill de Blasio, the 29th edition of GALA ITALIA took place on February 20th in the Grand Ballroom of The Pierre Hotel in Manhattan. The GALA ITALIA is well-known as being the most the exclusive and prestigious event in favor of great Italian wines. The event proved to be a great success as it saw the presence of the most notable Italian producers, the principal Italian restaurants in New York City, and a selection of food products of high class. Indeed, leaders in the wine and food industries exhibited their best Made in Italy products to a qualified and carefully-selected group of trade representatives, journalists and VIP, thus bringing these products to the forefront of the New York scene. GALA ITALIA began at 12 p.m. on Thursday and ended after midnight, at the end of which the elegant Gala Dinner was held. The Gala Dinner saw an exceptional pairing of wines and gourmet dishes, followed by an awards presentation of gold medals to wine producers, who were welcomed on stage by the applause of over 370 guests adorned in black-tie dress and decorations as they gathered in the Grand Ballroom of The Pierre Hotel, the most luxurious venue in New York. The ceremony concluded with the exceptional performance of Francesco Cafiso, a talented Italian jazz musician who performed recently at the White House for President Barack Obama. Of great honor for the GALA ITALIA — the leading Italian wine event held annually in the United States for almost thirty years — was the message that Mayor Bill de Blasio sent to the Italian Wine & Food Institute. In his message, the Mayor, who states that he has always been proud of his Italian origins, is pleased that New York can once again host an event of such importance that emphasizes the best of Italian wine and food. The Mayor also remarked that for more than thirty years, the Italian Wine & Food Institute has contributed to educating American consumers on gastronomy and quality Italian wines, as well as on a variety of Made in Italy products, and that, thanks to GALA ITALIA, the Italian Wine & Food Institute has contributed to preserving Italian culture in New York while also emphasizing Italian restaurants, fashion and music. Over 500 of the most select operators of the wine and food sector, journalists and VIP took part in what for years has become the most significant event for Italian wine in the U.S. In the elegant setting of The Pierre Hotel, located in the heart of Manhattan, Italian wines were paired with recipes harking back to the Italian culinary tradition and prepared by renowned chefs and restaurants. Attendees were given the opportunity to taste these authentic, traditional products, owing largely to the presence of the most distinguished food manufacturers of Italy. GALA ITALIA has long been an initiative of great commitment and result, with the presence of the media, as well as an excellent showcase for producers of high-quality Italian wine and food. The Wine & Food Tasting was the focal point of GALA ITALIA. The Grand Ballroom of The Pierre Hotel was set up beautifully with a number of “stations” that were assigned to the various exhibitors. Numerous wineries were present at GALA ITALIA, including: Abraxas – Vigne di Pantelleria, Asti DOCG, Belguardo, Bertani, Jacopo Biondi Santi, Biondi Santi – Il Greppo, Ca’ Bolani, Mazzei – Castello di Fonterutoli, Castello di Lispida, Castello di Querceto, Cavit, Emporio Bruca, Fattoria del Castel Pietraio, Feudo Principi di Butera, Feudi di San Gregorio, Cantina di Mogoro, Cantine Giorgio Lungarotti, Marco Maci, Mezzacorona-Nosio, Planeta, Rocca delle Macie, Sella & Mosca, Tenuta del Garda, Tenuta Le Velette, Valdo Spumanti and Zonin. As part of the Italian culinary excellence in the U.S., some of the best companies in the Italian food industry participated in GALA ITALIA, such as: Agriland Coffee, Agriland Italia, Ferrarelle, Ferrero, Illy Caffe, as well as some of the best known restaurants in the city, like Macelleria, Osteria del Circo, Risotteria Melotti, Serafina, Sirio Ristorante, all of which offered a tasting of their finest products for the occasion. Guests sampled on their stands the following: trionfi di salsiccia with pepperoni; rice focaccia, ham and smoked cheese (all gluten free); bruschette; trippa; farinata; risotto with scallops; and many other delicacies exemplifying the Italian culinary tradition. Moreover, each wine manufacturer selected high-quality, vintage wines to represent their best production. To give further publicity to the quality of the wines exhibited at GALA ITALIA, the “Certificate of Merit” was awarded to the finest wine of each participating winery, and carefully selected by a special American jury. The provision of the “Certificate of Merit,” for wine and food representing Italian excellence in the world took place during the wine tasting. The certificates were presented by the Consul General, Minister Natalia Quintavalle. During the Wine & Food Tasting, an elegant, colorful catalogue specially made for the GALA ITALIA was distributed to all of the guests. The catalogue dedicated ample space and prominence to all of the companies participating in GALA ITALIA, as well as to its sponsors, including Banca Intesa Sanpaolo, Ferrarelle, Ferrero, MSC and Omnia. To provide more visibility to the wines and food products presented at GALA ITALIA, a special website was launched that highlights these products to the public with images of their labels and detailed descriptions. At the conclusion of the Wine & Food Tasting, a brief interval was held in which the Grand Ballroom of The Pierre Hotel was completely transformed with a whole new, spectacular look for the Gala Dinner. The formal black-tie dinner commenced with the national anthems and the toasts to the President of the United States and the President of the Italian Republic, who granted his high patronage to the event and sent a warm message to the president, Cav. di Gran Croce Lucio Caputo, and to all the participants in the great event. During dinner, which was prepared by Chef Nicola Valle and under the supervision of Giovanni Rana, guests were served four exquisite courses paired with vintage wines. Guests were treated to the following wines for the toasts: Mezzacorona, Rotari Flavio, 2005, and Valdo “Oro Puro” Prosecco di Valdobbiadene Superiore, DOCG, NV. The menu started with raviolo aperto, beets and goat cheese, artichoke ravioli, pecorino and sauce of fresh herbs, accompanied by Zonin, Masseria di Aletemura, Fiano del Salento IGT, 2012. The second course included ravioli baccala’ in black squid ink pasta and lobster alla diavola, which was paired with Biondi Santi, Sassoalloro IGT Rosso Toscana, 2009. Then guests were treated to the third course: njuda ravioli, fresh burrata and spicy bread crumbs coupled with Castello di Querceto, “Il Sole di Alessandro” IGT Colli della Toscana Centrale, 2008 and Lungarotti, Torgiano Rosso Riserva, Rubesco Vigna Monticchio, DOCG 2007. Following these three delicious courses was the dessert: Vin Santo Gelato, Sicilian paccheri with chocolate, ricotta, pistachio and candied orange, fried ravioli with cream and fried ravioli with chocolate. The dessert was paired with Abraxas, Passito di Pantelleria, DOC, 2008 and Consorzio Asti, Asti DOCG, 2013. At the conclusion of the dinner, special Gold Medals of Merit were presented to wines of outstanding quality and to their producers. The medals were received by: Jacopo Biondi Santi, Pierluigi Bolla from Valdo Spumanti; Alessandro Francois from Castello di Querceto; Luca Rigotti from Mezzacorona; Francesco Rabellino from Zonin; Jannie Romani from Abraxas; and Maria Teresa Severini from Lungarotti. A special award was also given to Consorzio Asti DOCG, who participated with the institutional label, and to Chef Nicola Valle. Over 360 guests and journalists witnessed the ceremony, during which various other important personalities were honored, including: Cavaliere del Lavoro Giovanni Rana for excellence in the food sector; Hon. Frank Guarini; the Mayor of Turin, On. Piero Fassino; Dr. Silvia Formenti, Chair of the Department of Radiation Oncology at NYU Langone Medical Center; Hon. Patricia de Stacy Harrison, President and CEO of the Corporation for Public Broadcasting, and the talented Sicilian musician, Francesco Cafiso, whose credentials include playing at the White House. Mr. Cafiso was presented with a special award to highlight the historically rich contributions made by the Sicilian jazz musicians in the U.S. and around the world. The night concluded with the lively music of Panorama Orchestra that encouraged guests to dance late into the night. The GALA ITALIA has been organized by the Italian Wine & Food Institute under the high patronage of the Italian Ambassador in Washington, in collaboration with the Italian Trade Commission/ICE-Agency and the extraordinary sponsorship of the Ministry of Economic Development. New York – February 5…..High-quality Italian wine will once again receive its much-deserved spotlight in the grand setting of New York, this time on the occasion of the 29th edition of the GALA ITALIA. This annual event will take place on Thursday, February 20th in the Grand Ballroom of The Pierre Hotel in New York. In addition to wine, Italian food will be a significant factor in GALA ITALIA, as shown through the confirmed participation of leading food manufacturers and famous restaurants. The emphasis on pairing authentic Italian wine and food gives further relevance to this traditional Italian event, which is close to celebrating its 30th anniversary. The GALA ITALIA will be an initiative of great commitment and importance, with significant exposure to the media, as it promises to bring Italian wines to a competitive level in the wine market. With its high-class presentation, the GALA ITALIA will give greater luster and prestige to the top Italian wines, distinguishing them from competing production that attempts to be on the same level as Italian wines and beat them in price. At the GALA ITALIA, some of the most prestigious wineries of the peninsula will be presented, such as: Abraxas, Belguardo, Bertani, Jacopo Biondi Santi, Biondi Santi-Il Greppo, Ca Bolani, Castello di Fonterutoli, Castello di Lispida, Castello di Mogoro, Castello di Querceto, Cavit, Fattoria del Castel Pietraio, Feudo Principi di Butera, Feudi di San Gregorio, Lungarotti, Marco Maci, Mezzacorona, Planeta, Rocca delle Macie, Sella e Mosca, Tenuta Castelbuono, Tenute del Garda, Tenuta Le Velette, Terre di Bruca, Valdo Spumanti, e Zonin, among others. The GALA ITALIA will see the participation of a select number of Italian wineries and the personal presence of the most respected names in the Italian wine industry, all of whom will come directly from Italy to present their finest wines. Indeed, each manufacturer will present a particular wine with a special vintage particularly selected for GALA ITALIA. To emphasize the exceptional quality of the wines to be presented, an American jury of experts will select the best wine of each participating winery and present these wines with a special “Certificate of Merit” to further inform the press and trade representatives in attendance. An important element of GALA ITALIA will be the grand Wine and Food Tasting, which will take place between 12 p.m. and 6 p.m. in the Ballroom of The Pierre Hotel, specially prepared and decorated for the occasion. At the Wine and Food Tasting, there will be present over 500 specially selected and qualified trade representatives, restaurateurs and journalists from across the Atlantic Coast of the United States, many of whom have been participating in this important event for Italian wine for many years. Held annually for more than a quarter of a century, the GALA ITALIA promotes the best of Italian wine, food, and gastronomy in the United States. The most well-known manufacturers of specialty food and beverages, including Agriland Coffee, Agriland Italy, Ferrero, Ferrarelle, and Illy Caffe’, and some of the most successful Italian restaurants in New York, including Macelleria, Osteria del Circo, Serafina, Sirio Restaurant, and SD26, have confirmed their participation in the event, selecting for the occasion their best products to promote wine and food in a unique setting. The GALA ITALIA will also feature an elegant, colorful catalogue, in which ample space will be dedicated to all of the participating companies and the event sponsors: Banca Intesa Sanpaolo, Ferrarelle, Ferrero, MSC and Omnia. The catalogue will be distributed to all of the guests in attendance and will be subsequently sent to the major industry leaders in Italy. In addition to the catalogue, a new website has been launched by the Italian Wine & Food Institute to enhance the visibility of the participating companies in the event. The website (www.iwfinews.com) highlights each wine with an image of its label and a detailed description of its characteristics, as well as emphasizes the participating restaurants and food producers with enlarged images of their logos. These elements of the event will serve to improve the visibility of the participating companies, wine producers and food producers involved in this edition of GALA ITALIA. The GALA ITALIA will be complemented by a formal, black-tie Gala Dinner, which will be held in the Ballroom of The Pierre Hotel later in the evening. This unique four-course dinner, prepared by an Italian chef, will be paired with special vintage wines. Moreover, many of the most important American personalities, distinguished guests, and principal representatives of the media will be present at the Gala Dinner. 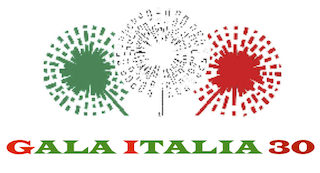 Organized by the Italian Wine & Food Institute, the GALA ITALIA is held under the patronage of the Italian Ambassador to Washington, in collaboration with the Italian Trade Agency – ICE and the sponsorship of the Italian Ministry of Economic Development. New York, February 6 — Italian excellence, prominent Italian and Italian-American personalities, superb cuisine, vintage wines, music and the presentation of prestigious awards will be the essence of the 48th edition of the Gala Dinner Dance & Awards Ceremony of the American Society of the Italian Legions of Merit. Under the high patronage of the President of the Italian Republic, H.E. Giorgio Napolitano, this annual event will take place in the notable setting of The Pierre Hotel on Thursday, February 20, 2014. Influential leaders in a variety of fields, VIP, representatives of the media and other distinguished guests will meet in one of the most elegant venues in New York for the highly-significant celebration of ASILM, a non-profit organization whose members have all received decorations from the Italian Republic. This year’s ASILM Gala, strictly black-tie with decorations, promises to be an evening of great importance. After the toasts to the President of the United States and President of the Italian Republic, the Gala will showcase one of its most pleasant surprises of the evening: a spectacular four-course dinner specially prepared by Italian chefs and paired with eight vintage wines. Following the dinner will be yet another great feature of the Gala: the awards ceremony, during which the “Gold Medal of Excellence in Wine” will be presented to some of the most famous Italian wine producers, who will all come from Italy to attend the Gala and will generously donate their exceptional wines for the dinner. The wine producers include: Jacopo Biondi Santi (Biondi Santi), Pier Luigi Bolla (Valdo), Alessandro Francois (Castello di Querceto),Teresa Lungarotti (Lungarotti), Calogero Mannino (Abraxas), Francesco Rabellino (Zonin) and Luca Rigotti (Mezzacorona). This year, the “Grand Medal of Merit” will be presented to Cav. di Gran Croce, Hon. Frank Guarini, and the Mayor of Turin, Hon. Piero Fassino, for their outstanding activities and valuable support of ASILM. During the awards ceremony, the “Grand Award of Merit” (the highest presentation of the Society) will be given to Cav. del Lavoro Giovanni Rana for the pursuit of Italian excellence in the field of cuisine. Mr. Rana, the most popular food manufacturer in Italy, has made a remarkable contribution to the dissemination of high-quality pasta in Italy and throughout the world, and is currently engaged in a challenging, complex operation in the United States in an effort to further spread the classical Rana production. The “Grand Award of Merit” will go to two very important personalities who are particularly distinguished in their fields: Dr. Silvia Formenti, Chair of the Department of Radiation Oncology at NYU Langone Medical Center and one of the top leaders in breast cancer research; and Hon. Patricia de Stacy Harrison, President & CEO of the Corporation for Public Broadcasting. The ceremony will conclude with the consigning of the “Grand Award of Merit” to the talented musician, Mr. Francesco Cafiso, for underlining the substantial contribution that Sicilian musicians have made to the evolution of jazz in the United States and around the world. Mr. Cafiso has played at the White House for President Barack Obama, thus exemplifying the link between the pioneers of Sicilian jazz in the United States and projecting their influence towards the future of jazz. Among the personalities that will be present are: Ambassador Sebastiano Cardi, Consul General Natalia Quintavalle, and the Mayor of Turin, Piero Fassino, who will also provide a welcome to the delegation of ASILM during its June 2014 visit to Turin. Indeed, the list of award recipients this year will expand the Society’s honor roll. Last year’s Gala ceremony honored four extraordinary leaders in their fields with the Grand Award of merit: Comm. Dr. Fabrizio Michelassi, Surgeon-in-Chief of New York Presbyterian/Weill Cornell Medical Center; Il Cav. di Gran Croce, Hon. Arnaldo Pomodoro, the famous Italian artist whose works stand prominently throughout the globe, from the Vatican Museums to the United Nations in New York; Cav. di Gran Croce, Hon. Antonin Scalia, Associate Justice of the Supreme Court of the United States; and Gr. Uff. Hon. Ronald Spogli, former United States Ambassador to the Italian Republic. To add more a meaningful, long-term impact to this upcoming event, the proceeds from the Gala will go to the ASILM Education Fund. The fund was recently established by the Society for undergraduate college students who would like to pursue a degree in the Italian language. The scholarship will be granted on the basis of achievement, character, motivation and financial need, and will be subject to renewal throughout the recipient’s undergraduate college career. The evening will continue with guests dancing to the enjoyable music of Panorama Orchestra.